In 1887 William Randolph Hearst hired Ambrose Bierce as a writer, beginning a long association with the San Francisco Examiner. Just twenty-three years old, Hearst was still launching his career, while Bierce was pushing up against forty-four and had been floundering from job to job since the Civil War. According to Bierce’s later account, a young man from the paper showed up at his doorstep. “‘You come from Mr. Hearst.’ Then that unearthly child lifted its blue eyes and cooed: ‘I am Mr. Hearst.’” At the Examiner Bierce would publish a regular column, “Prattle,” along with dozens of stories, and by the end of the century both he and the young man who hired him would be two of the most famous Americans in journalism. I have voluntarily surrendered a salary of $75.00 a week in order, partly, to preserve my self-respect, partly to do more congenial and in the end profitable work. . . . The Examiner is unwilling to let me go, and I have consented to give it some work during the absence of the present editor in New York—have just sent it a story in fact. But Prattle is dead, and nothing but the direst straits would induce me to revive it. It was to be only one of many resignations submitted by Bierce to his employer; for another ten years Hearst was able to keep his top journalist from actually quitting. 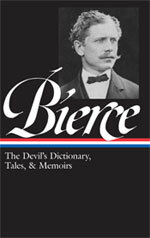 The story referred to in the letter, “The Eyes of the Panther,” was the capstone of the expanded 1898 edition of his most famous collection, In the Midst of Life (which had originally been published by a small press in San Francisco as Tales of Soldiers and Civilians and which is included in Library of America’s omnibus edition of Bierce’s works. Although many readers have interpreted the story as a tale of the supernatural, S. T. Joshi in The Weird Tale suggests that the “bluntness” of the story’s final sentences signals a “nonsupernatural resolution.” The ambiguity of the closing allows the reader to choose between two genres in which Bierce excelled: psychological studies and tales of the fantastic. A man and a woman—nature had done the grouping—sat on a rustic seat, in the late afternoon. The man was middle-aged, slender, swarthy, with the expression of a poet and the complexion of a pirate—a man at whom one would look again. . . . If you don't see the full story below, click here (PDF) or click here (Google Docs) to read it—free!